Goodmans Heritage Portable review | What Hi-Fi? Remember when radios were just radios? You’d turn them on, twiddle a knob and, out of the static, voices and music would emerge. We’ve come a long way since then. 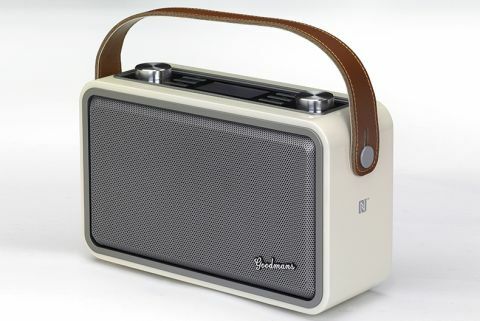 Take the Goodmans Heritage Portable, for example: it may look like an old fashioned wireless, but it’s got more in common with a modern all-in-one hi-fi. It’ll deliver your radio, of course, but it does so via FM, DAB and internet radio. It can stream and play all of the music on your home network, too, and you can play tunes from your phone using Bluetooth – you can even pair the two devices via NFC. Most exciting is the inclusion of Spotify Connect, which means it connects directly to Spotify’s music servers while you use the app on your phone as a fancy remote control. Finally, by using the Undok app you can combine the Heritage with other compatible audio devices to create a multi-room music system. With all that tech crammed into a small, portable unit costing just £170, you have to imagine that some corners have been cut. If so, they aren’t immediately obvious, and there’s much to like about this unassuming little device. But let’s start with something we don’t like: the display. Positioning it on the top edge of the radio might be a good way to keep the retro face looking lovely and uncluttered, but it makes no sense from a usability point of view, especially when combined with some viewing angle limitations. Navigating menus and the like generally involves tipping the whole unit towards you. Do try and avoid poking yourself in the eye with the antenna, won’t you? If you’re looking for a less risky way to operate the Goodmans, you could do far worse than use the Undok app (shown above). You may not think about downloading it unless you’re looking to create a multi-room system, but it allows you to control all of the radio’s functions from anywhere in the house and is very straightforward to use. Speaking of multi-room, it’s worth being aware from the off that any device you want to link up with the Goodmans needs to also be based on Frontier Silicon chips. However, the list of compatible devices is fairly uninspiring, with only Ruark Audio really getting the blood pumping. Back to the Heritage Portable, though, and it is rather nicely made. There’s a satisfying weight and solidity to the stylishly retro box, and while certain elements don’t stand up to very close scrutiny (that handle may be real leather but it’s far from the finest), the overall look and feel is pretty impressive. The two knobs (left for volume, right for tuning or navigating) have a nice feel to them, too, even if the thin, flat rectangular buttons that accompany them are a bit less tactile. Before getting to the sound quality; a quick word about equaliser settings. The Goodmans has a bunch of them, and as is so often the case, they’re generally not worthy of your time. However, the ‘Normal’ EQ that the radio defaults to is different to ‘Flat’, and it’s the latter we’d recommend you use – ‘Normal’ increases both bass and treble and makes it sound a bit boomy at the bottom, hard at the top and unclear in the mid. Stick to ‘Flat’ and things are better. There is still a bit of hardness to the treble that some might find a little insistent, but the overall presentation is nicely balanced and clear. Listen to a talkie show, such as Desert Island Discs, and the voices are nicely projected and easy to follow, with good body and texture. Bring on the music, whether from internet radio or Spotify Connect, and while the Goodmans has nothing on a more dedicated micro system (the Denon D-M40DAB) or wireless speaker (the Sonos Play:1, for example), for a radio it’s very listenable, with an overall weight, clarity and rhythm that’s rare for a such a compact portable device. Only that slightly nagging hardness blemishes the presentation. That blemish is just enough to cost the Heritage Portable a star, but it’s still close to the top of the radio charts. If you like the looks and the feature set, you’re unlikely to be disappointed by this retro-styled Goodmans.